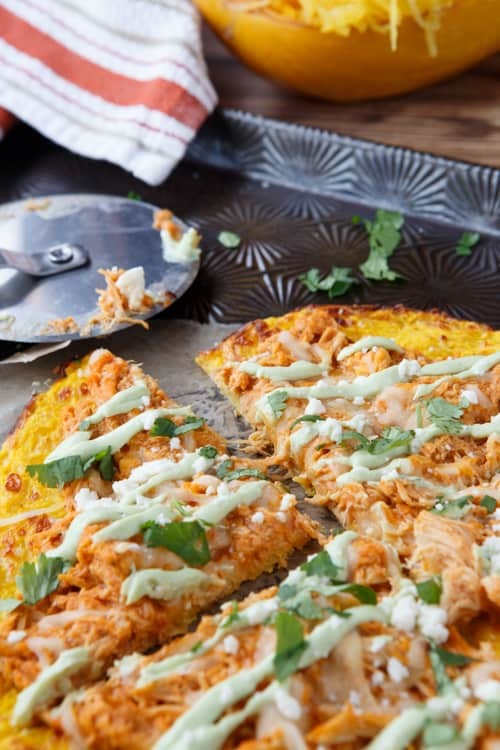 A gluten-free, healthy take on Buffalo Chicken Pizza with a pizza crust made out of spaghetti squash! Good news! 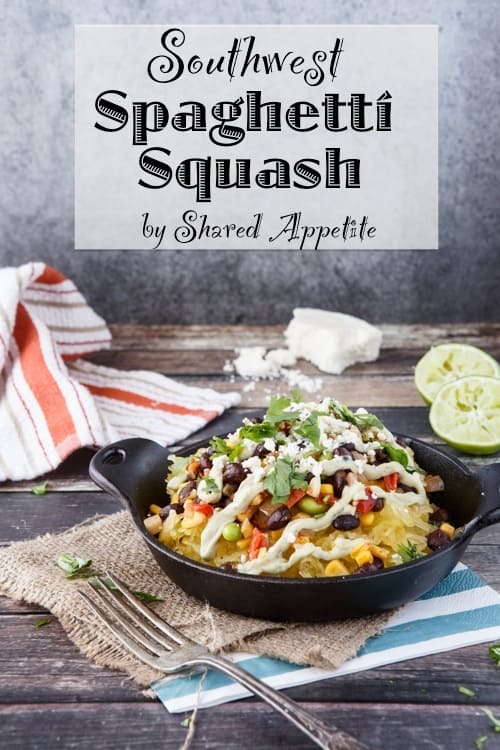 This is the last time you’ll be hearing about spaghetti squash for awhile. Haha, I know, there’s been a lot of squash going on up in here. 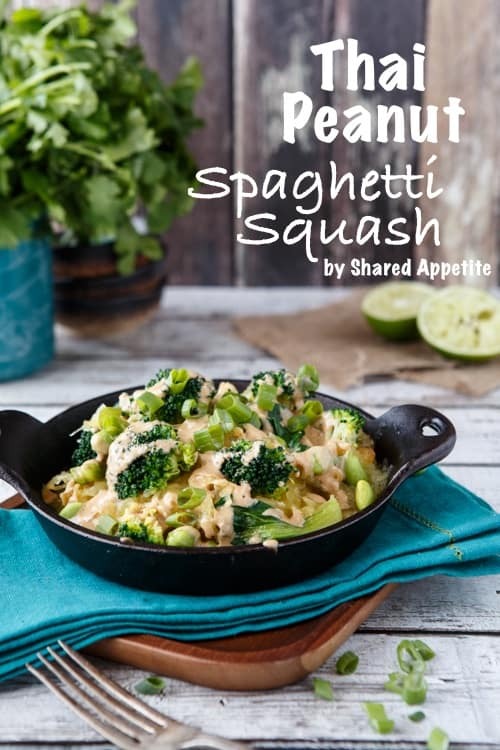 Luckily for you, I have the week off from work this week (one of the many perks of being a teacher), so I’ll be spending a bunch of time creating new non-squash recipes. But listen, don’t go blaming me if you start going through with squash withdrawal. It may happen (it probably won’t). But it could. Especially if you go making this pizza. It’s good. Dangerously good. 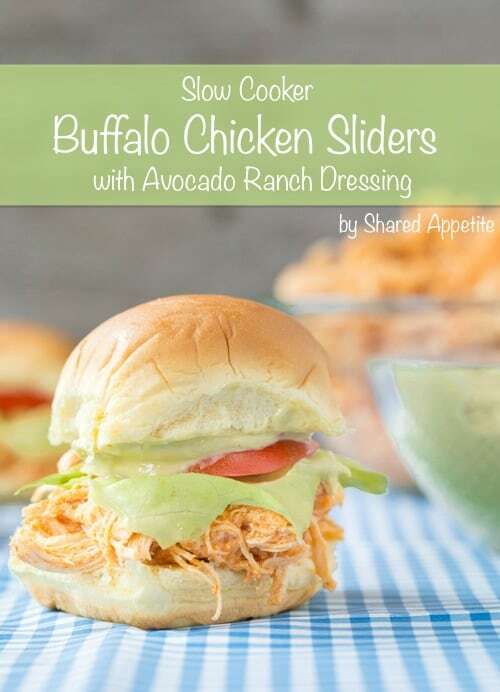 I made my Slow Cooker Buffalo Chicken Sliders for The Big Game a few weeks back, and had a bunch leftover. To the freezer it went. That is, until I started thinking about what I wanted to top my Gluten-Free Spaghetti Squash Pizza Crust with. And listen, I know what you’re thinking. Buffalo chicken is not healthy. But that’s the whole fried chicken wing talking. 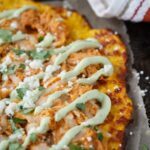 Making pulled buffalo chicken in the slow cooker is, dare I say, pretty darn healthy. And my shrinking waistline agrees. 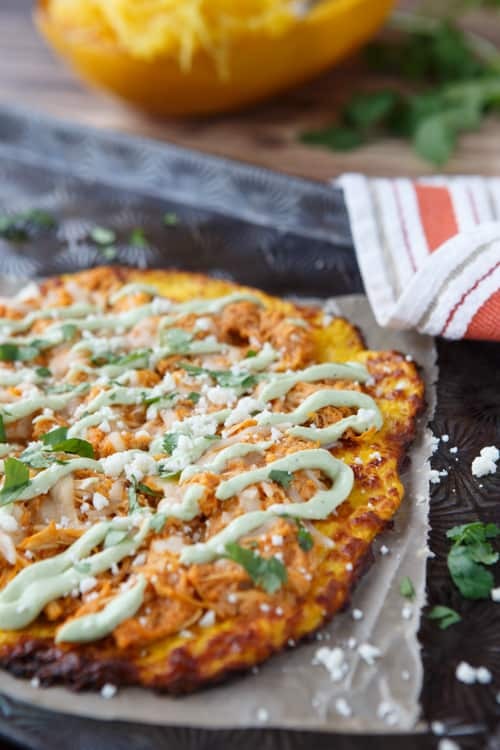 You can eat buffalo chicken pizza AND lose weight. You’re welcome. Of course if you load your pizza with a pound of cheese, it’s tough to justify the whole skinny thing. Just go with a light sprinkling. It’ll be okay, I promise. And what really makes this pizza pop. What really makes those taste buds go mmm-hmmm is the healthy avocado crema. Tangy Greek yogurt and buffalo sauce just seem perfect for each other. I hope Chobani is listening… but if they go stealing my buffalo chicken greek yogurt idea, I’m suing. Just saying. Preheat oven to 375°F. 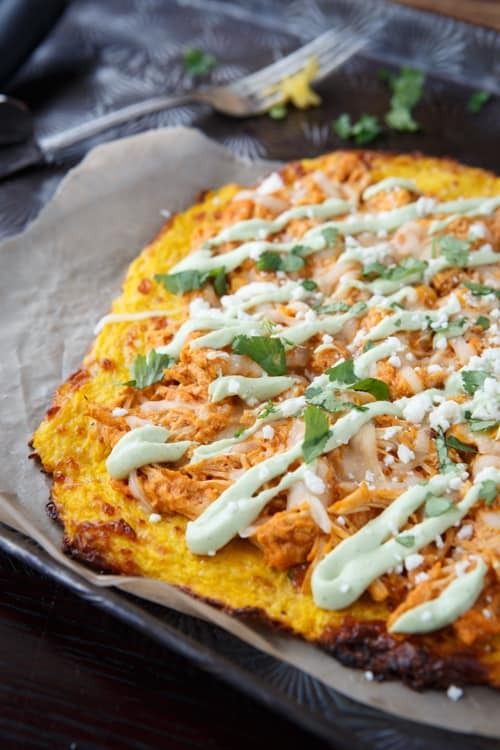 Top spaghetti squash crust with about 1 cup of Slow Cooker Buffalo Chicken. Sprinkle lightly with low-fat shredded mozzarella cheese. Bake until cheese is melted, approximately 5-10 minutes. Top with queso fresco, healthy avocado crema, and cilantro. Serve immediately. Combine avocado, Greek yogurt, juice from 1/2 lime, garlic powder, cumin, paprika, and extra virgin olive oil in a food processor until smooth. Season with Kosher salt and freshly ground black pepper. Stir in juice from other 1/2 of lime if desired. This looks amazing. I can’t wait to try this crust. New to GF, and this is just what I need to make it okay! I’m so impressed that you made pizza crust with squash, Chris! This definitely had my mouth watering (yes, at 6.45am 😉 and especially as my last homemade pizza with a wholewheat crust ended up tasting a bit boring to be honest. What I love about this is that you had the chicken all ready to go in your freezer … perfect! I think I desperately need to start “operation stop drool production” this pizza looks fabulous! I could easily eat a whole one! Seriously! Shut the front door! L.O.V.E this Chris! I have been craving pizza lately and this is perfect and I’m pretty sure that the avocado crema just makes everything better! 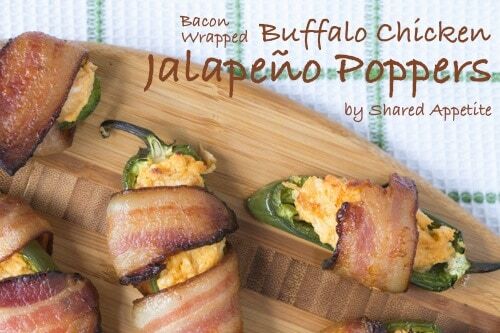 This is a totally win all around, and pretty sure my hubbie will love me forever if I make this! 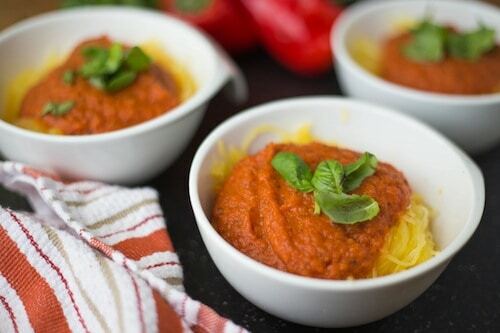 Oh My – are you saying that this wonderful masterpiece is actually healthy?? Man, it looks way too awesome to be real. The greek yogurt sauce idea is brilliant! What a genius idea all the way around! 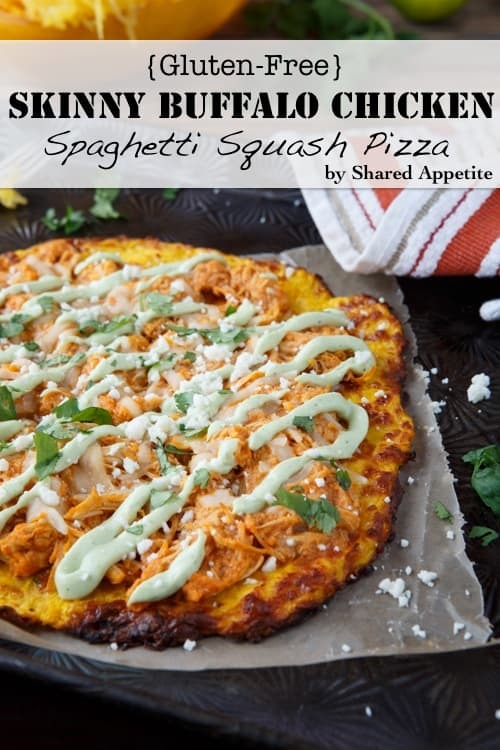 Spaghetti squash crust, healthy buffalo chicken and avocado creama…yum! I make a similar avocado cream that I use as a dipping sauce with this mexican style chicken. 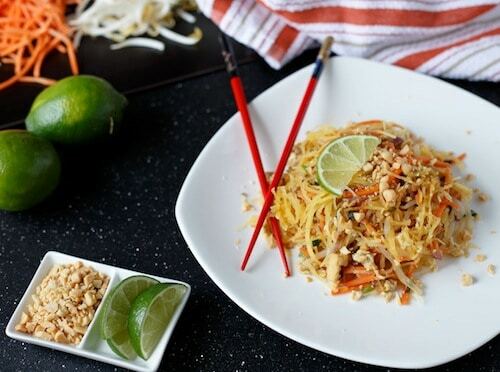 It is super delicious and can just imagine what that would taste like with buffalo chicken. Definitely adding this to my menu! this is a totally guilt free pizza!